North-east businesses are being invited to an event to hear about the opportunities available to them when the new wind farm HQ is built at Fraserburgh Harbour. Moray East Offshore Wind Farm announced last year that their operations and maintenance onshore base would be built in Fraserburgh. To make local companies aware of the benefits this will bring to them, a ‘Meet the Buyer’ event is being held next week. 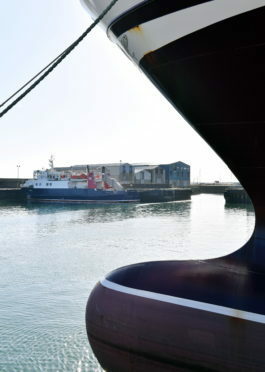 In a step to maximise the opportunities this development would create, a collaboration was set up in summer between the harbour, Aberdeenshire Council, North East Scotland College at Fraserburgh along with Moray East and MHI Vestas. The Fraserburgh Local Alliance With Moray East (FLAME) group hopes the event will give north-east businesses the confidence and contacts to get involved. Project spokesman Craig Milroy said: “We’ve a small number of contractors and they’ve got contractors working for them so we’re really hoping businesses from Aberdeenshire can take these on. “There’s short term contracts for the actual building and there’s the longer term ones so it will bring benefits to the local economy. “We will be selling electricity for a lower figure compared to other suppliers and as we bring costs down we need the local economy to be competitive. Business opportunities on offer includes work relating to transport, haulage, waste disposal, onshore and offshore technicians and equipment hire. Council leader Jim Gifford believes the development will bring ‘ongoing benefit’ to the area. The event will be held in the Fraserburgh college campus from 4pm to 6.30pm on January 29. To register interest in the event email jane.burnett@aberdeenshire.gov.uk with the title ‘Fraserburgh’.